A waterfall chart is an interesting way to present quantitative data visually. Using color-coded bars, it shows how an initial value is affected by subsequent positive or negative data values. These kinds of charts are also known as bridge charts (showing a connection between following bar graphs) or Mario charts (due to the middle bars being suspended mid-air). 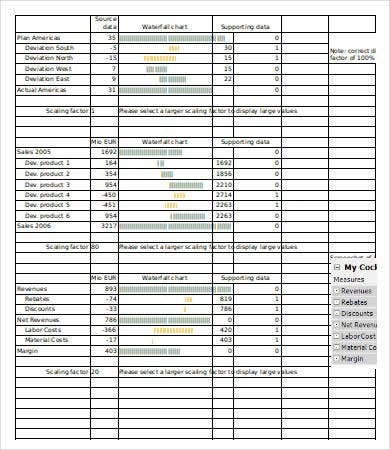 If you are giving a report and need to present cumulative data, this is a great way to help people understand it intuitively. 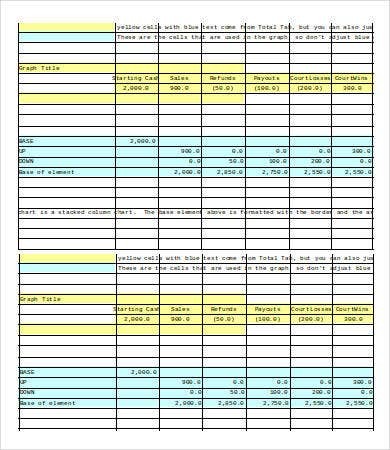 You can make such a chart in Microsoft Excel. 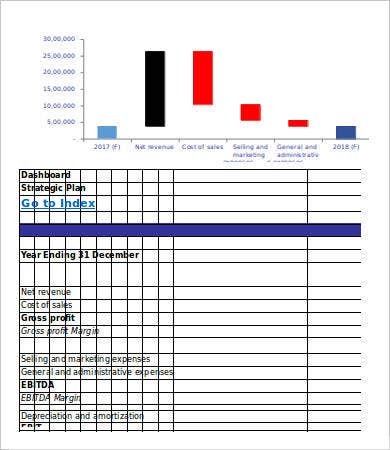 To save you even more time, you can look for a free Chart Template you can download and modify. Don’t let the beginning complexity stop you from using this great method. 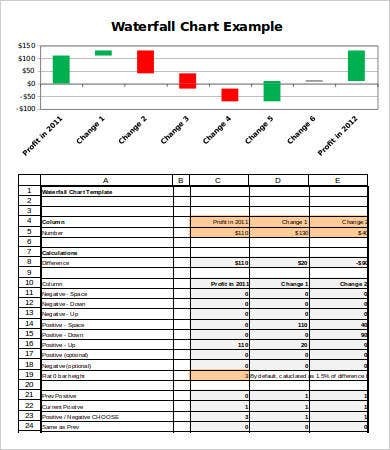 Check out this collection of Excel waterfall charts to help you get started. A waterfall chart is a form of effective quantitative visual presentation. 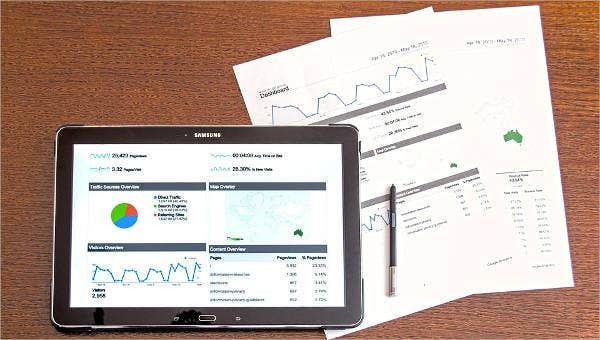 It will show a sequence of values in the form of colored bar graphs and is commonly used to demonstrate and analyze the rise and fall of an initial value given certain happenings—e.g., as a visual for a business’s profit and loss statement. How Do I Make a Waterfall Chart? 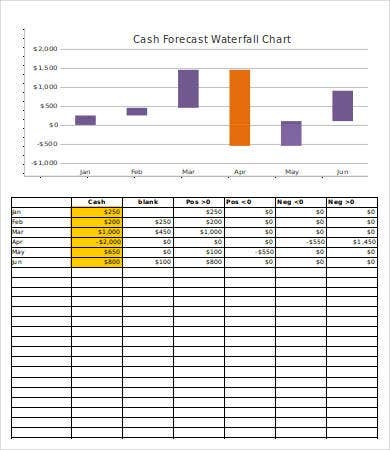 The easiest way to utilize a waterfall chart is to use a pre-made chart. You’ll notice that each Excel Chart Template looks very different. This is to give you more options until you find a format that works for you personally and professionally. Floating bars. These columns plot the transition of value along the graph, using one color for value increase and another for value decrease. Connecting lines. These connectors are why this chart is also called a bridge graph, and it will add to the clarity of analysis at a glance. Color coding. As mentioned above, different columns or bars will have different colors to quickly see positive and negative values. How Do I Use These Charts? 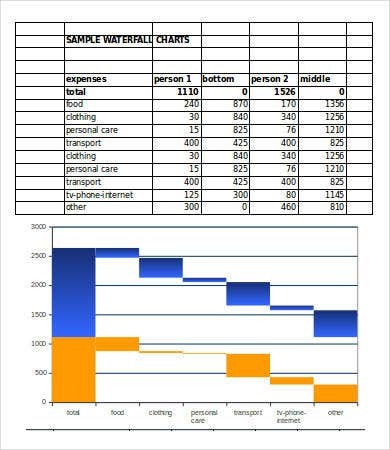 Each Waterfall Chart Template has been laid out with example data and headers already in them. The Excel coding might be tricky for beginners, and there are tutorials on the Web to show you how to make such a chart from scratch. 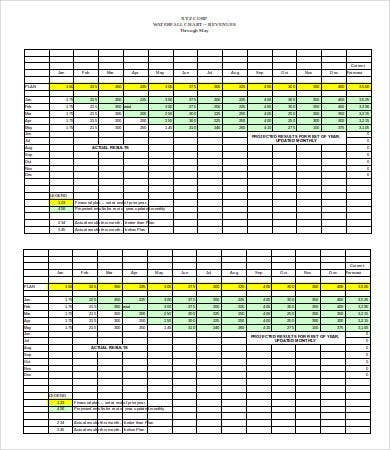 Download these free charts to save you the extra effort. It is not difficult to pick up from there, once you understand what a waterfall chart is meant to do. Before you start, make sure you have a data table prepared for the values you will need to input.